I’m an active member of the Mar Vista Community Council Green Committee working to create greater awareness of environmental issues and eco-friendly lifestyles in Los Angeles. I recently received my California Real Estate license and work as a “green” realtor. I’ve also written (and received) an eco-tourism grant for Cyrila’s Chocolates, a small Mayan-owned organic cacao farm (www.cyrilaschocolate.org) in the poor southern region of Belize. In addition, I go to Nepal in support of a “micro-finance through art patronage” project (www.nepaldog.com). Since I often get pill bugs in my compost (along with lots of worms), I let my chickens go at it in the compost bin. They help take care of the undesirable bugs and are very happy chickens afterwards. My son, Jesse, was the assistant manager of the Center for Agroecology and Sustainable Food Systems Farm at UC Santa Cruz. He inspired me (and rototilled the lawn) to get me started. I love fresh salsa. I cut 4-5 ripe, but firm tomatoes into small pieces, add fresh cilantro (I use a kitchen scissor to cut it up), a medium onion (the one pictured came from the Mar Vista Farmer’s market and I only used half) and diced jalapeno peppers, seeds and all, with salt to taste. Use as many peppers as you like – especially if you like it hot. I don’t use lime juice like many recipes call for. It’s perfect with fresh tortilla chips or barbecued carne asada on a hot summer day. (Click here for recipe). I must give most of the credit to Jesse and his many years of farming experience. He always has great advise. 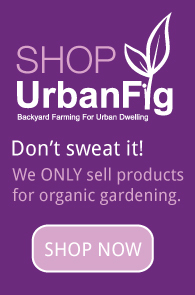 Being a relatively new gardener, I learn a lot from my mistakes and get ideas and inspiration from Organic Gardening magazines, newsletters like UrbanFig and the Green Booth at the Mar Vista Farmer’s Market . Just go for it and have fun. And bigger is not better, both in vegetable and garden size. As many as I can. Since mine is a young garden and fairly large in size (it was once a large lawn) there’s been plenty of weeds to pull, soil composting to do, drip hoses to lay out and bugs to eliminate. Generally I spend about 10 hours a week. Up to two hours or more per day about five days a week, especially in the morning and when the days are still cool. The “lawn” garden is approximately 1400 square feet and the back garden is approximately 250 square feet. I plant in the ground in beds delineated by wooden boards I “repurposed” from old Ikea shelving, broken concrete and recycled brick. It used to be keeping the chickens out, but now they are in my fence enclosed “orchard” area. The tent caterpillars attacked my sweet broom and butterfly bush with a vengeance this year. I picked them off by hand, but have been using an organic insecticide as well. Not much at the moment. Since it’s been so hot (and I’ve been busy with other projects) I’ve let the gardens go, but am weeding and turning the soil, adding compost and mulching with straw in anticipation of my next planting. It’s time consuming, but it makes me happy. I’m proud of my garden and the influence my son has had on making it an important part of my life. I also enjoy preparing food with the “fruits” of my efforts and sharing vegetables and fruit with my friends and neighbors. I feel that knowing where our food comes from gives people a better appreciation of the hard but rewarding work of growing food. I have a better appreciation of our ecosystem. Eating a tomato off of the vine or a strawberry right from the plant still warm from the sun. I also love to listen to the birds in the morning, observe my kitties as they glide along the pathways, watch my chickens as they burrow into dirt pockets, see the butterflies and bees visit the flowers and enjoy the movement of my pinwheel spinners, flags and plants as the breeze flows through my gardens. It doesn’t have to be a picture perfect or a bumper crop producing garden, but make it your garden. Personalize it. I have $1 pinwheels spinning in the beds, prayer flags I brought back from Nepal strung between tomato cages and solar lights that illuminate the pathways at night. I’ve also been able to grow tumerick and ginger from fresh root I purchased at Whole Foods. My son’s secret is to plant floral bed ends like lavender and sweet broom to help attract bees. I love repurposing materials in the garden. I use broken cement for pathways, old Ikeas shelving (taken apart) for bed delineation, potted plants to add dimension to the landscape and old plastic 1 gallon nursery pots for weeding containers and trash bins. Visiting Susan’s L.A. garden was truly one of the highlights of my life. I’ve been a wishful ‘farmer’ since I was a little girl and felt totally at peace in the midst of this oasis in the city. Susan’s efforts were far beyond expectation and the produce was truly delicious. I still recall the taste and texture of her home grown artichokes and the pride in Susan’s daughter Bow, as she shared with me! The wind chimes, laughter and cackle of chickens was also a true symphony of joy, creating peace and pleasure, a true escape from the hustle and bustle outside the gates. Susan’s son Jessee is a brilliant inspiration to Susan and to all of us who believe we can do our share to care for ourselves and our planet. What a nice tribute to a great Urban Farmer.